An artist and self-described healer, Felipe Jesus Consalvos earned his living, for most of his life, as a cigar roller. He was born in Havana, Cuba, and immigrated to Miami around 1920, eventually settling in Philadelphia. Consalvos’s work is often playful and slyly political in tone. 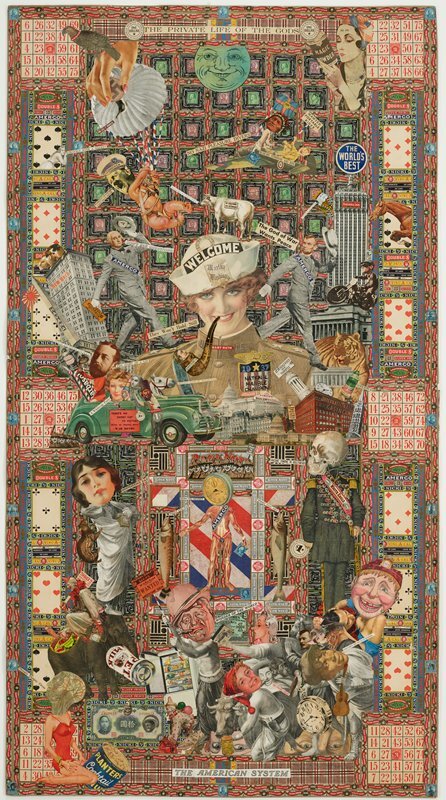 This work encompasses many of the sociopolitical themes Consalvos is known for, such as race, war, class, and gender, and their relationship to popular culture. In this work, Consalvos takes aim at political figures, lampooning German dictator Adolf Hitler as a big baby, as well as American presidents George Washington and Abraham Lincoln, who are both caricatured as a vaudevillian duo. His self-taught, obsessive body of work—over 800 surviving collages on paper and other unexpected surfaces including found photographs, musical instruments, and furniture—was discovered in 1980 at a west Philadelphia garage sale. The American System is a prime example of Consalvos’s collage-on-paper work. It is also one of his largest collage works to have been discovered. This work represents one of a few works in Mia’s collection by a Cuban American modernist.